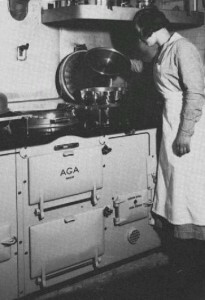 First AGA cooker  patented in Sweden by the inventor Gustav Dalén in 1922. The big change in the layout of kitchens came with the introduction of the continuous built-in worktop lining the kitchen walls, as opposed to centrally placed, free-standing tables. One forerunner of this phenomenon was the late nineteenth century pantry. Here we see the prototype with continuous waisthigh counters, a built-in sink with cupboards underneath and cabinets with sliding doors hanging on the walls above. In Europe, the new architecture of the 1920s re-appraised the house plan and based its findings upon functional rather than decorative criteria. In 1923, the Bauhaus exhibited a onefamily house called Das Haus am Horn. Here the L-shaped kitchen had a storage centre with the sink and sideboard placed along the wall. The sideboard was split into two elements  a base cabinet and wall cabinets. The worktop continued round the corner, flush up to the gas cooker, which had another worktop on the other side. In 1927, J.J.P Oud designed low-cost kitchens for houses in the Weissenhof Siedlung in Stuttgart. These kitchens had a large window and an L-shaped run of continuous worktops with a preparation area, a sink, a food chest vented to the outside and a refuse can emptied from the yard. 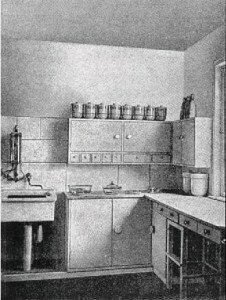 The cooker was placed to the left of a hatchway communicating directly with the dining room. Hello admin, i must say you have hi quality articles here. Your page can go viral.